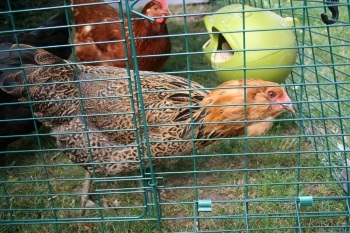 Business Chicken is the namesake of this site, and the prettiest of the three chickens. She is the one who lays the light blue (almost robin-like) eggs. I’ve heard her called an “Easter egg chicken” for this quality. We named her Business Chicken though before she started laying and before we realized the eggs would be blue (though later it makes a nice allusion to blue chip stocks, blue suits, etc). She is Business Chicken because she’s ALL about the BIDNESS. If there’s grain, she’s pecking it. She doesn’t care what the crazy monkey humans are doing with the rest of the cage. She makes a beeline for what she cares about – usually edible- and that’s that. Her friendliness quotient is somewhere between Shy and Bossy. She doesn’t like being held per se – you need a firm arm around her wings to hold her up – but she doesn’t seem as ready to peck your eyes out as Bossy is. For The J , all chicken escapes are hilarious (yea Bossy and Business and Shy have ALL had their moments), which is good, because with Business Chicken, if she’s outside the coop, she means Bidness.